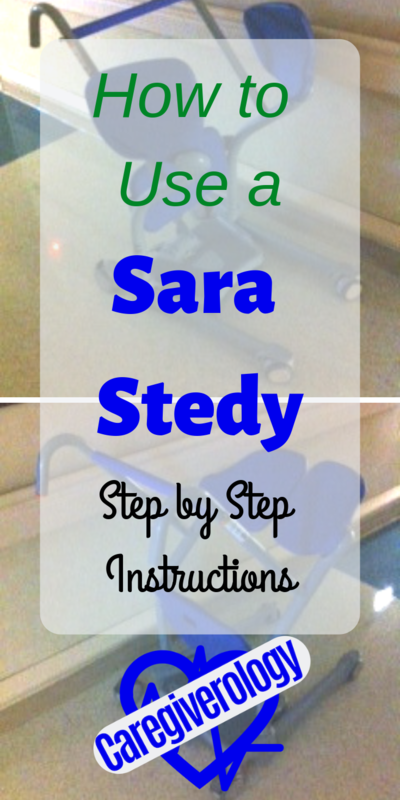 The sara stedy is a very nifty piece of equipment that helps patients ambulate more easily. The best way to describe it would be a cross between a walker and a wheelchair. It helps them stand with the ease of a walker and moves them around with the ease of a wheelchair. It does all of this without having to turn the patient. What kind of patient is this device for? If they meet the following criteria, they may be a good candidate. It is a lot easier to actually use it than it is to describe how to use. Looking at it for the first time will probably just cause confusion and wonder at the same time. But when you see it in action, you are just baffled at how easy it is to use and see how useful it can be. The only downfall is they have to be in a sitting position in order to use it. They can be sitting on the side of their bed, in a chair, on a toilet, a bedside commode, etc just as long as they are sitting. If they are unable to sit down, they shouldn't attempt to use it anyway otherwise, they may fall. 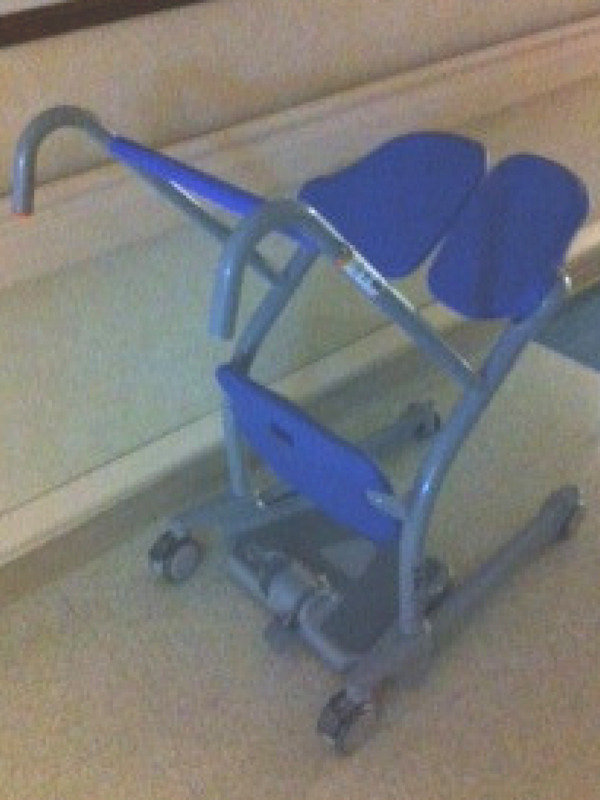 There are two flaps for the patient to sit down on called seat wings. Make sure they are pushed up before rolling the sara stedy towards them. There are four wheels at the bottom. Two of them can lock in place. Make sure the wheels are unlocked so you can roll it towards them. As you slowly move the device towards them, make sure you don't bump into their legs or elbows. When the stedy is in the desired position, lock the two wheels so it doesn't slip out from under them. If you are having trouble placing the device underneath them, depending on which model you are using, the other two wheels in the back may be able widen or narrow down by pushing on two foot pedals. It has this feature so it can be placed as close to the patient as possible. This is especially useful when pushing it underneath a bed or around a chair or toilet. After bringing the sara stedy as close to them as possible, place their feet onto the platform, called a foot plate, located on the bottom of the device. This will prevent their feet from dragging on the floor when they are moved around. There are also knee guards that their knees should rest against. They help secure their legs to make sure they don't slip off the foot plate whenever they sit on the seat wings. After you make sure they are in a good position, have them grab onto the rail directly in front of them to help themselves stand up. Tell them to pull their belly up to the rail. Assist them if needed. After they are standing as upright as possible, bring the seat wings down and have them slowly sit on them. You can always help them ease down and assure them that there is a seat underneath them. Make sure they hold onto the rail during this entire process. Check to make sure their feet are still firmly on the platform and their shins and knees are comfortably against the knee guards. 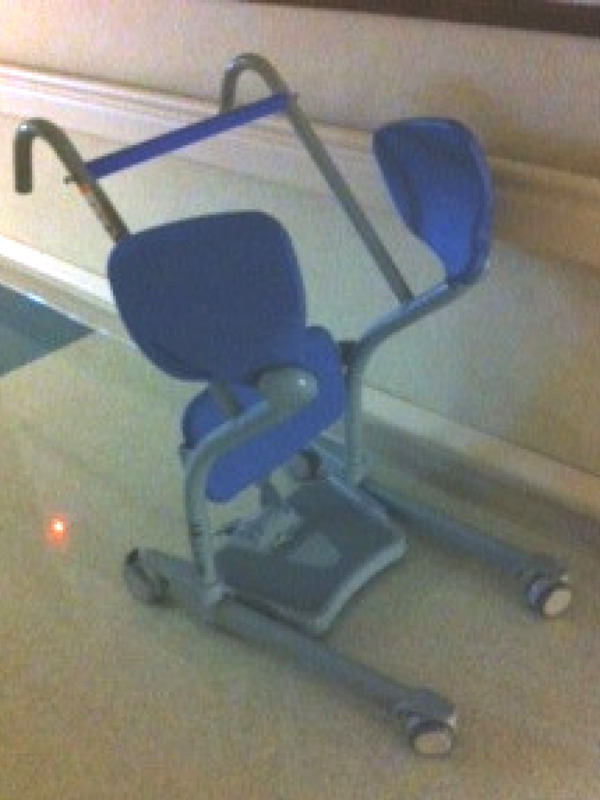 You may now unlock the wheels and use the two handles next to the rail that the patient is holding on to to push, pull, and steer them into the spot where they need to be. Again, you can always widen or narrow the two back wheels if needed. When their bottom is directly underneath where you want them to sit down, lock the wheels back into place. Have them slowly stand up straight, belly to the rail, all while holding firmly onto the rail in front of them. After they are completely upright and balanced, slide the seat wings out from under them and have them gently ease onto the chair, toilet, etc. Of course you can always help them as needed. They can now let go of the rail. You can now unlock the wheels again and slowly move the sara stedy out from under them. Make sure you tell them to watch their feet. You may have to assist their feet off of the foot plate if they are unable to lift them. There are two slightly different kinds that I have used. The main difference is the seat wings. One of them has wings that swing up and down, while another has wings that swing sideways. The one that swings sideways is preferred because the one that swings up and down can sometimes rub up against the patient's bottom while you are trying to flip them up and down. You may not even be able to lift the seat all of the way without pushing against their bottom. The other difference is some of them don't have the adjustable wheels that move inward and outward. Of course it is preferred to have this feature otherwise, you may not be able to get the sara stedy close enough to the patient.